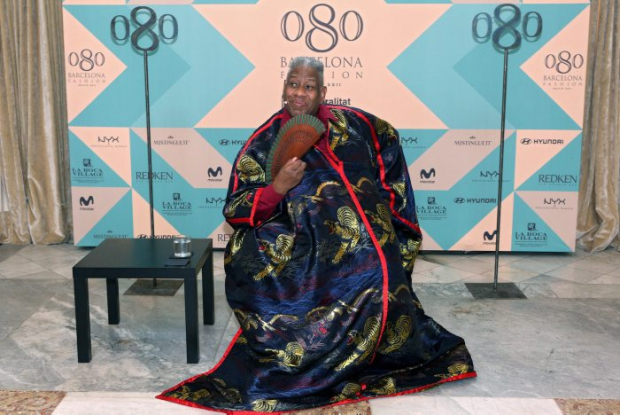 This morning, the 080 Barcelona Fashion has welcomed the international guest of this 22nd edition: André Leon Talley, ex editor at Vogue USA and living legend of the history of fashion. Talley has come to Barcelona to present the fashion documentary on his life “The Gospel According to André”, by Kate Novack, which has been screened in an open session at the Sant Pau Modernist Enclosure. After the screening, Talley, alongside fashion journalist Eugenia de la Torriente, editor in chief of Vogue Spain, has taken part in an inspiring talk where he has, once again, called for more diversity in fashion. “It’s important that everything evolves. I believe in an evolution towards more diversity in all areas. There must be big size models, transgender ones… Culture is evolutionary and fashion isn’t an exception” he has stated. Throughout the conversation, in which André Leon Talley has talked with Eugenia de la Torriente and an audience formed by fashion students and professionals, the ex fashion editor has explained that the key to his success are his origins in North Carolina, United States. “I believe in God, in faith and in my ancestors, especially my grandmother. I never forget where I come from despite the glamour; and this is what has allowed me to go throughout my long career”, which spans over 25 years in the front row of global fashion. André Leon Talley kicked off his career besides the iconic fashion editor Diana Vreeland and, in his youth, he entered the subversive world of Andy Warhol and The Factory. In the conversation held within the 080 Barcelona Fashion parallel activities he has pointed out the importance of the pop artist in his career: “I learned the fashion Bible at The Factory” he has revealed. On his long stage at Vogue magazine he has said that “it is part of who I am, but I wanted to transcend that stage, although I continue to collaborate”. He has also had some words for his friend and mentor Diana Vreeland: “From her, I learned that behind every dress there is a story, which can be simple or a dream”. Besides his career, André Leon Talley has also shared his outlook on fashion and the importance of individuality. Known for his personal look, he has reflected on how vital it is to have a personal style: “clothes are my armour. When I was at college I wore very extravagant clothes and in the 2000 I discovered the kaftan and the African influence”, which, since then, have turned into his signature style. In addition, he has mentioned the incursion of social media in fashion. André Leon Talley has described himself as a “dinosaur”, although he is in favour of the so-called democratization of fashion where “everybody can be an editor”. “Social media is individuality, an space where evryone can express freely and inspire others” according to André. However, he has also defended the role of fashion magazines and editors because “information has to be found in the experts” he concludes. In this first visit to Barcelona, Talley has praised the setting of the 080 Barcelona Fashion, the Sant Pau Modernist Enclosure and has thanked the organization for the invitation. As for the documentary “The Gospel According to André”, he is confident that it will let the public “to take something from me, because it’s a film that goes beyond fashion and tells my story of improvement and dignity”. Because of his great career and contribution to fashion, André Leon Talley will receive this afternoon the Fashion Tribute of the 22nd edition of the 080 Barcelona Fashion in the award ceremony, that will take place from 7 p.m. A recognition that will top off the visit of this legend of international fashion to the Catalan runway.